Before they became guardians, they were humans. The secrets of their past and the memories of the guardians’ previous lives are finally unlocked in the record-breaking final chapter of ALONG WITH THE GODS: THE LAST 49 DAYS. 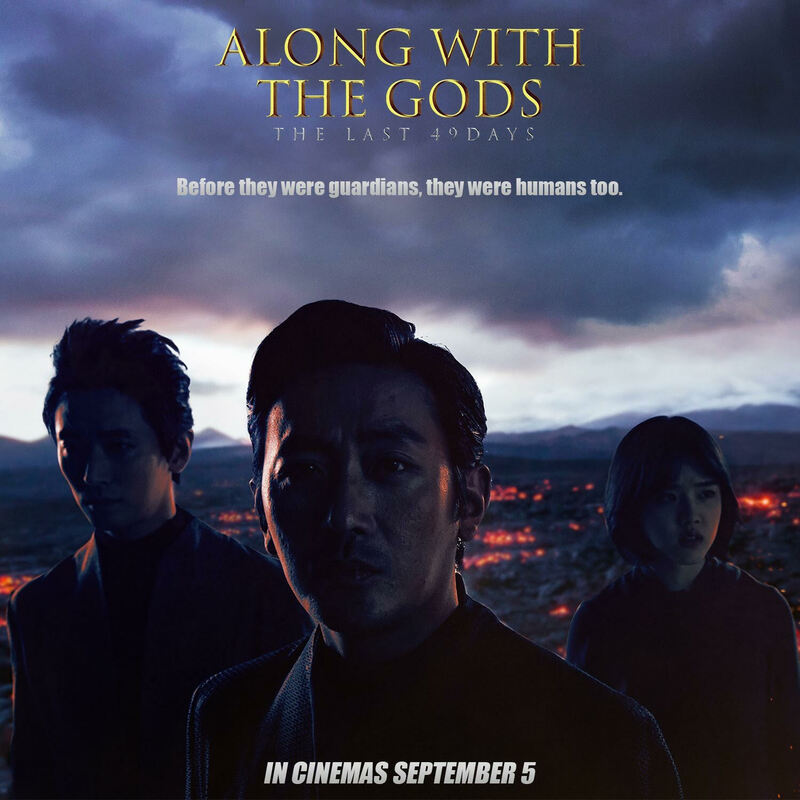 If they assist 49 souls get their reincarnations in a millennium, the three Afterlife Guardians Gang-lim (HA Jung-woo), Hewonmak (JU Ji-hoon), and Deok-choon (KIM Hyang-gi) were promised to get their own reincarnations by the king of Afterlife, Yeomra (LEE Jung-jae). The 3 Guardians choose Su-hong (KIM Dong-wook) as their candidate, but doubts were cast on their candidate, since he wreaked havoc in the Living World by turning into a vengeful spirit. In exchange for Su-hong’s fair trial, Yeomra tasks the 3 guardians to ascend an old man from the Living World who has surpassed his allotted lifespan. While on the mission, they encountered a rogue god known as Household God (Don LEE) who was protecting the old man and his grandson from the Afterlife Guardians. Eventually, Hewonmak and Deok-choon discover that the Household God was the Afterlife Guardian who ascended the two of them a millennium ago. To get back their memories of their previous lives, they begin helping the Household God. Can they handle what they will discover from their previous lives? And how will it affect Su-hong’s trial? According to Director KIM Yong-hwa, in The Two Worlds, they focused into building a believable world in order to focus more on character building and the relationships between them in THE LAST 49 DAYS. Another thing to look forward to in the movie is its CG effects and amazing production designs that make the worlds in the movie look more real. Just like it’s high-grossing prequel Along with the Gods: The Two Worlds, ALONG WITH THE GODS: THE LAST 49 DAYS recorded an all-time high opening admission in Korean movie history. The movie has the biggest opening week for any Korean film in North America, Australia, New Zealand and Taiwan as well. Watch the Korean fantasy film that is set to make another blockbuster history! ALONG WITH THE GODS: THE LAST 49 DAYS will open in theaters nationwide on September 5. From VIVA International Pictures &amp; MVP Entertainment.